The notion and visits of the scholarly recess are rapidly changing. Must remember that changes in the scholarly record are evolutionary not revolutionary, a question of pace not core concepts. Note how in the framework specific formats are not included, this model tried to capture a high level look at the EVR. Also, all the elements on the slide may not be captured. Data sets are now thought of as evidence, but increasingly be seen as outcomes and of intrinsic value. Framework components are not "new"
Look at F1000 posters as supplement to Slideshare. All of these tools are ways for scholars to get credit for their work (writ large). Does the disintermediation of some of these files, how do we build tools or services that will keep the important elements of them? 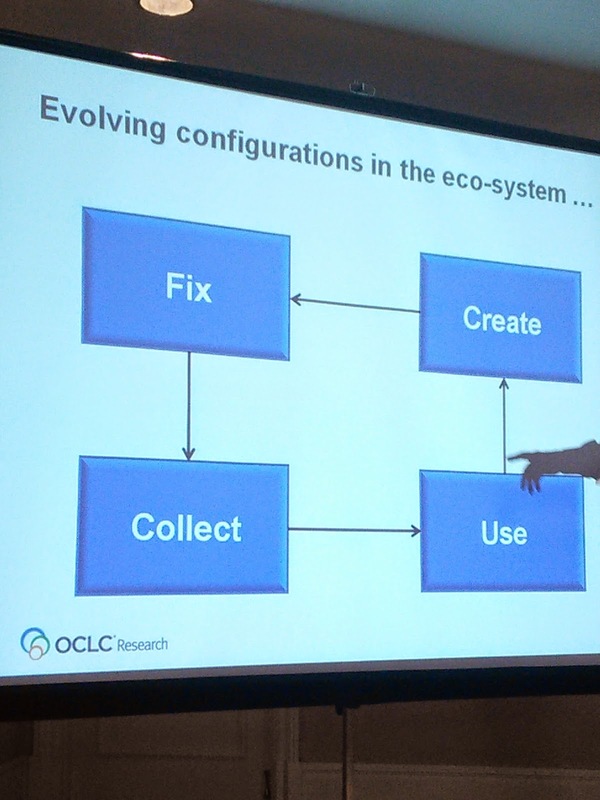 This session will report on work in OCLC Research to develop a framework for thinking about the general scope and boundaries of the evolving scholarly record. 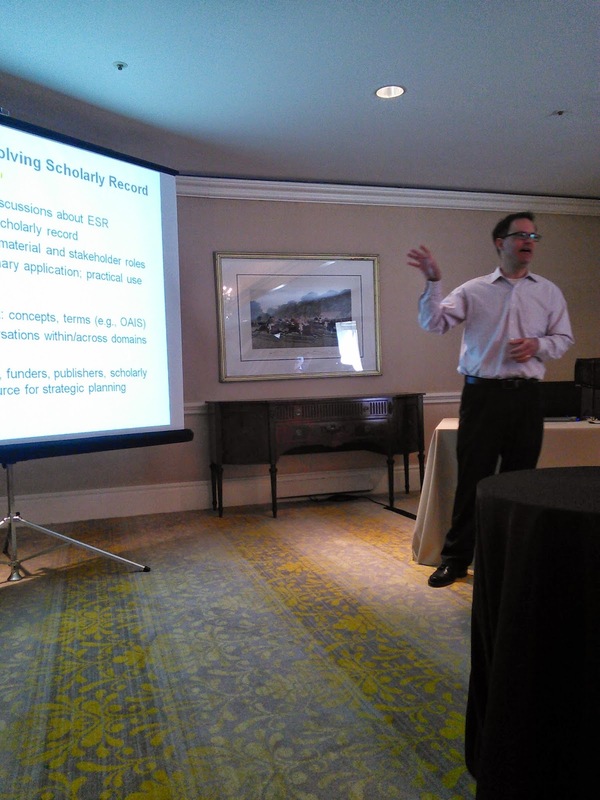 The scholarly record is evolving into something that promises to be vastly different from traditional print-based models. Its boundaries are blurring, driven by changes in research practices, as well as changing perceptions of the long-term value of certain forms of scholarly materials. The purpose of the framework is to help organize and drive discussions about the scholarly record within and across relevant domains, by defining key categories of materials and stakeholder roles associated with the evolving record. 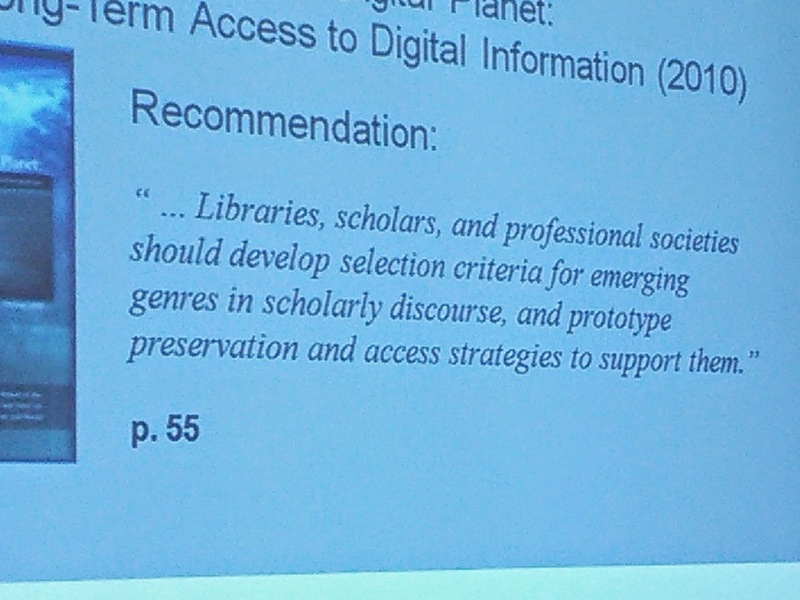 Such a framework would equip libraries, publishers, funders, scholars, and other stakeholders with a common point of reference based on shared concepts and terminology. 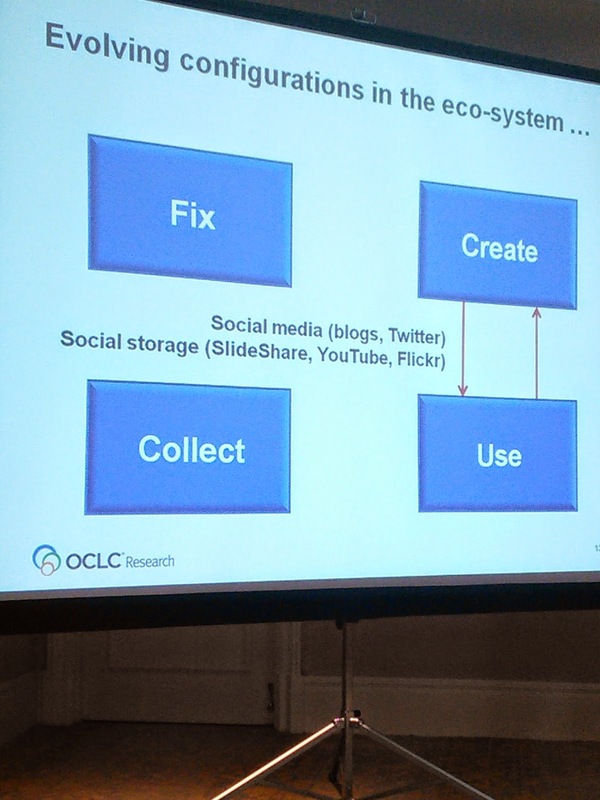 An increasingly diverse and digital scholarly record has important practical implications for institutions that acknowledge a mission for collecting, making available, and preserving it. 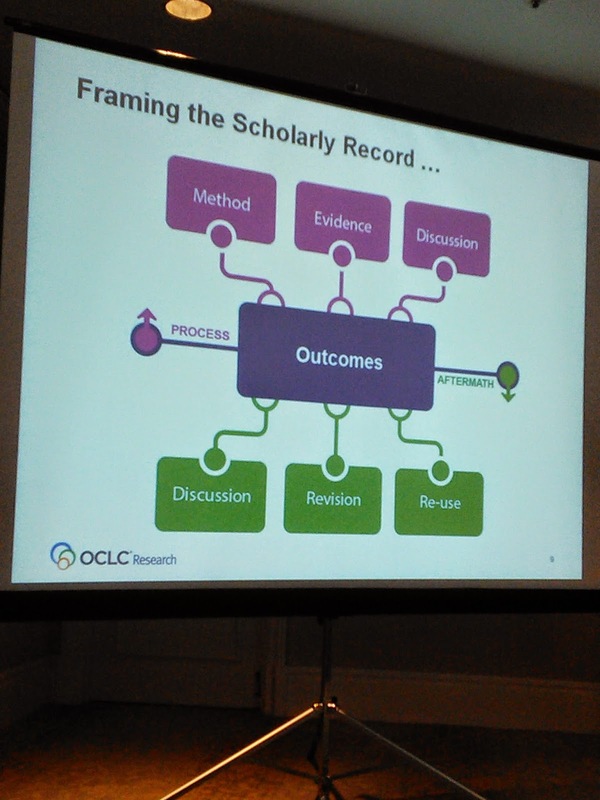 Fulfilling this mission requires a shared understanding among stakeholders of what the scholarly record encompasses. In addition to describing the framework, this session will also offer some speculation and discussion on future patterns of stewardship of the scholarly record, based on the view of the scholarly record presented by the framework. 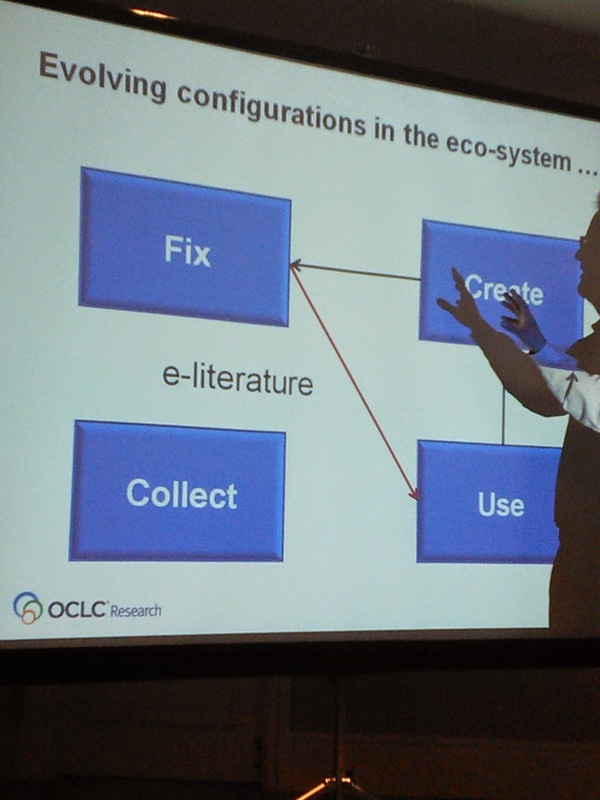 The OCLC Research team associated with this work includes Eric Childress, Ricky Erway, Ixchel Faniel, Brian Lavoie, Constance Malpas, and Titia van der Werf.